Park Falls, WI– High school bass fishing is spreading like wildfire, and, each summer, the best teams in the nation duke it out at the High School Fishing National Championship. Qualifying for the event is an accomplishment in itself, as only the top ten percent of anglers at state qualifiers make the big show. Last February, the team of Carter and Lee Rose Koza from Mt. Paran Christian School in Kennesaw, Georgia locked in a National invite by placing sixth at the Georgia State Finals on West Point Lake. Perhaps the Koza’s secret lies in their understanding of each other’s strengths and weaknesses better than that of their competitors, or the ability to rely on each other no matter what life throws their way. Because, you see, Carter and Lee Rose aren’t just fishing buddies; they’re brother and sister. 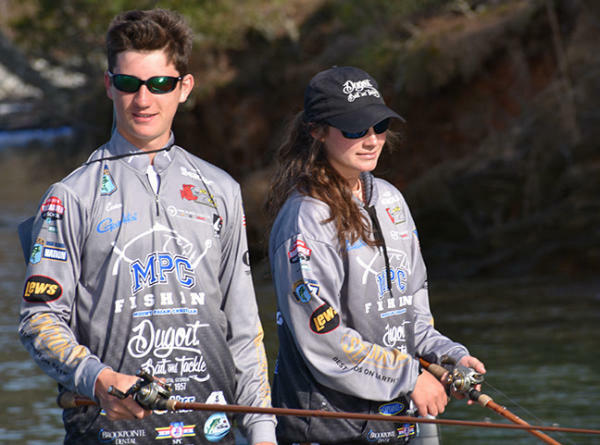 This June, that brother and sister team will compete in the High School Fishing National Championship, bringing a unique demographic to scholastic sports perhaps only seen in team fishing. Both outdoor enthusiasts, the Koza’s come from a fishing family. Their father, Jamie, is an avid tournament angler and tackle shop owner who plays the role of boat captain to Lee Rose and Carter. Carter started tournament fishing in his early teens, while Lee Rose pursued more traditional female scholastic sports, quickly earning a spot on the varsity basketball team. But, after tagging along on a few of Carter’s fishing tournaments, her love for fishing and competitive spirit combined into one and she promptly gave up basketballs for bass. Carter realized Lee Rose brought a dynamic he was missing in his fishing. “She has much more patience than me, and she fishes more thoroughly.” On numerous occasions, the team has found such meticulous methods to be the right recipe for a tough bite. Lee Rose, always the optimist, thinks her approach goes beyond the fish’s mood. “I try to bring a positive attitude and smooth Carter out a little when he gets upset,” she chuckled. In the end, the team finds a reliable set of techniques, taught early on by their dad, to yield impressive results. “Throwing crankbaits is our favorite way to fish,” Carter explained, “so, it’s not surprising that Legend Glass are our favorite rods.” The Koza’s insist that the St. CroixLegend Glass casting series offers the lightest crankbait rods in the industry; a testament to the linear S-Glass blank each is built around. The crankbaiter's favorite, Legend Glass, is now available in a spinning model. Carter and Lee Rose have big plans for their fishing far beyond the upcoming event. Each has researched fishing-related college programs and available scholarships and plans to take their skills to the next level. Perhaps we’ll someday hear a tale of college fishing teammates who seem to think alike, so in tune are they with each other, blowing past the competition with crankbait mastery. In that case, we’ll know the real story behind it all.